Which type of diamond anniversary band should I buy? Should my diamond anniversary band be straight or fitted? 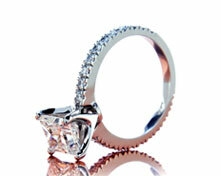 “I am looking for a one carat round diamond that will be used for a four prong solitaire style engagement ring. 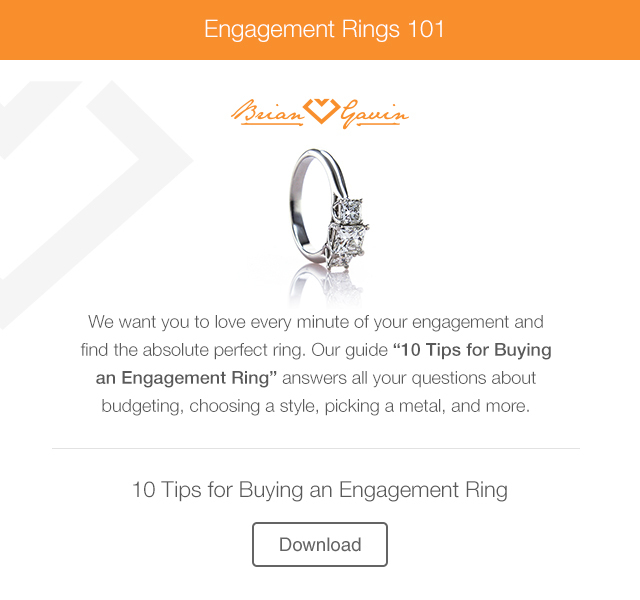 I am only interested in GIA Excellent or AGS Ideal cut, and thought that limiting my search to diamonds of that overall cut quality would provide me with the best options. 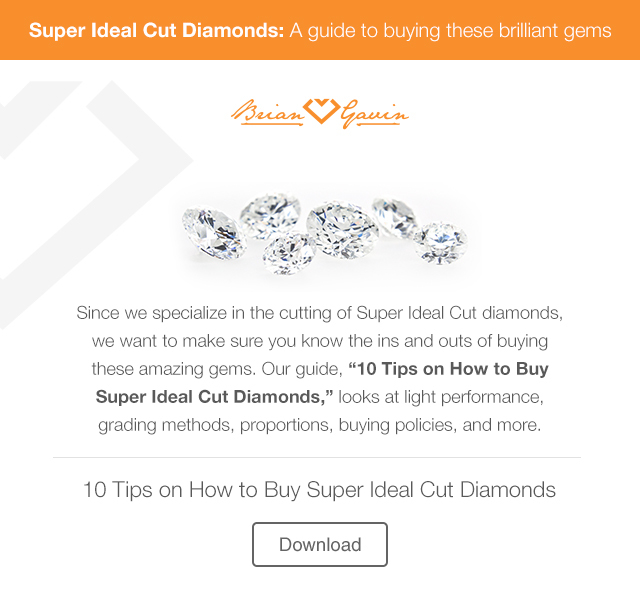 However I’ve recently run across the term “super ideal cut diamonds” which seem to be cut beyond the standards of the AGS Ideal and GIA Excellent cut grades. 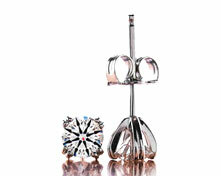 Can you tell me more about super ideal cut vs excellent cut diamonds, and what I should search for if I truly want a diamond that offers the best visual performance, I’m not so worried about the name per se, I simply want the very best, brightest, most sparkly diamond available within my price range of $10k or preferably closer to $9k if that is possible. 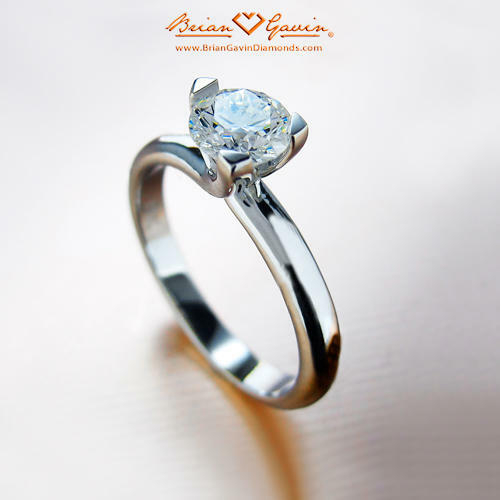 I suppose that the best place to start is by addressing the difference between AGS Ideal-0 cut and GIA Excellent cut round brilliant cut diamonds, because the grading platforms of the two gemological laboratories are pretty much identical for diamond carat weight, color, and clarity, but are dramatically different as far as diamond cut grade is concerned. Both gemological laboratories use Sarin computerized proportions technology to measure diamonds and determine the proportions of the diamond, however the two laboratories round off and report the measurements differently, with the American Gem Society Laboratory (AGSL) reporting the average measurements provided by the machine, and the Gemological Institute of American Gem Trade Laboratory (GIA-GTL) rounding off those measurements to the nearest half a percent or half a degree depending on whether the measurement is being reported in percent or degrees. 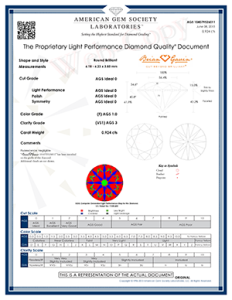 Thus when attempting to buy a diamond by the numbers, I prefer the data reported on an AGSL Diamond Quality Document (DQD) because the measurements provided are the actual measurements of the diamond, which are based upon the average of eight measurements per section; as opposed to being the rounded off measurements, of the average measurement. 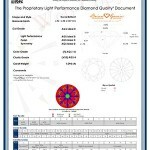 The data provided by the Light Performance grading platform of the AGS Laboratory, which relies upon Angular Spectrum Evaluation Technology (ASET) offers another clear advantage to diamond buyers. 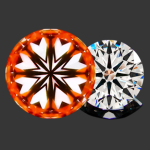 ASET provides a visual indication of how effectively a diamond is gathering light from the hemisphere in which it is being viewed from, and demonstrates how evenly light is being reflected and distributed throughout the diamond, in the form of different colors that represent different angles of light within the hemisphere, but also contrast and light leakage. 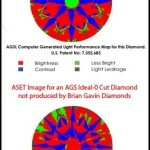 The AGS introduced their ASET based Light Performance grading platform in June of 2005, and has been continually updating the parameters of the grading platform in accordance with current research and developments in diamond cutting technology, which is why Brian Gavin Signature diamonds are submitted to the AGSL for grading, instead of the GIA, who introduced their diamond cut quality grading platform right around the same time, however it is based strictly on the polish, symmetry, and proportions of the diamond, without any consideration being taken as to the light performance of the diamond being graded. 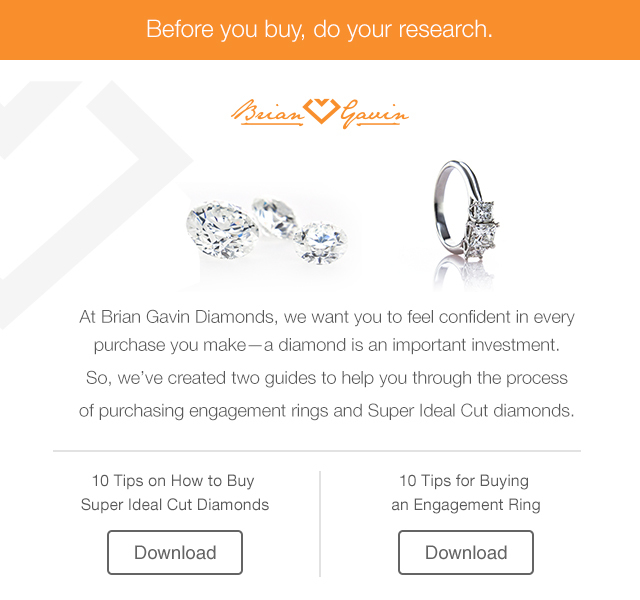 The term “super ideal cut” is generally used to refer to diamonds like the 0.924 carat, F-color, VS-1 clarity, Brian Gavin Signature round hearts and arrows cut diamond, which is described on the diamond grading report that appears above. 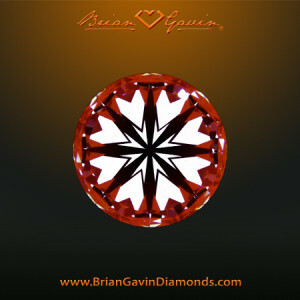 Not only does this diamond have an overall cut grade of AGS Ideal-0 and certainly qualifies for the overall cut grade of GIA Excellent cut, but the proportions of the diamond are within the center range of the parameters set forth for the zero ideal cut proportions rating by the American Gem Society Laboratory, and it exhibits a crisp and complete pattern of hearts and arrows as a result of the superior degree of optical precision that the diamond has been cut to, thus the diamond is “super ideal cut” and will exhibit the highest volume of light return, with a virtual balance of brilliance and dispersion, and broad spectrum sparkle that tends to be larger in size, bolder, brighter and more vivid than what most ideal cut diamonds offer. Which ideal cut diamond should I buy? This entry was written by Danny, posted on July 31 at 9:12 am, filed under Diamond Education. Bookmark the permalink. Follow any comments here with the RSS feed for this post. Trackbacks are closed, but you can post a comment.